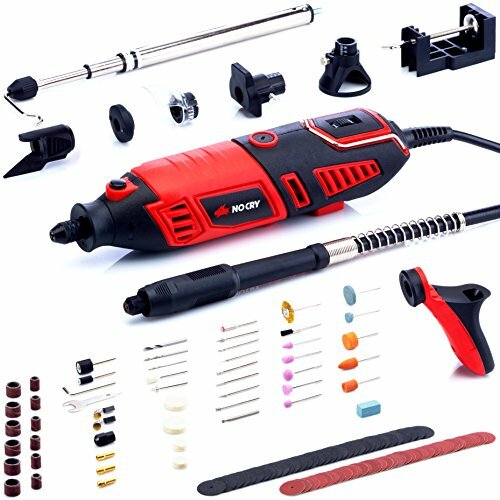 How does this rotary tool kit compare to other popular kits on Amazon? We might have just been able to hit the value vs. price sweet spot. While this is indeed one of the more affordable kits on the market, it has the ability to reach the speeds of $200 rotary tools, comes with a considerably larger attachments & accessories set and a powerful motor. And if you need to see it to believe it, no problem - if there is an issue, we'll replace your NoCry rotary tool for free or issue a refund. Which materials and projects can it be used for? Thanks to its competitive technical capabilities and the large variety of included attachments & accessories, it can be used for basically any project or material straight out of the box: carving, engraving, cutting, sanding, grinding, drilling, polishing wood, metal, glass, steel, plastic, tile, stone, aluminum, brass, shell...you name it. Is it durable enough to last through your projects? Yep. If you wear out the motor brushes or some of the accessories, there are 2 spares included in the kit, so you can quickly replace the parts and carry on with your work. To put it into perspective, this amounts to about 2x as long work time than with other popular rotary tool models. Quality USD 70 set that would normally cost around USD 200 to collect. Includes a collet nut, 3 collets, and a multi-chuck, a flex-shaft and an extendable stand, a precision handle, a cutting set, grinding / sanding, sharpening and cutting guides, a shield, a pivot light and 125 accessories in a handy storage case. Die-hard 170W / 1.4A motor that reaches speeds from 8,000 to 35,000 rpm, making the machine suitable for work on a large variety of materials from wood, plastic, drywall and tile, to glass, stone, and various metals like steel, aluminum, brass or copper. Comes equipped for use straight out of the box in carving, engraving, cutting, sanding, polishing, sharpening, cleaning, woodworking, grinding, grout removal and other projects. 2 replacement carbide brushes included. Is compatible with other rotary tool accessories that have a shank size of max Ø1/8 inches and can withstand work at high speeds. If your NoCry rotary tool doesn't perform as it should or is simply not for you, let us know, and we'll send you a free replacement or issue a quick refund.